Citrus Spray II Room Deodorizers ( DEODORIZER, ROOM, CITRUS II, SPRAY, 1.5OZ ) 24 Each / Case. 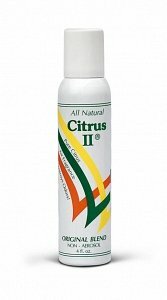 Citrus II air fragrance and odor eliminator is the fresh approach to controlling healthcare odors. Environmentally safe, Citrus II eliminates the harsh odors of urine, feces, decubitus ulcers, oncology departments, diabetic wards, labs and exam rooms. Citrus II is 100% natural so it is safe to use everywhere.Beaumont products are nationally licensed for sale and carry a limited lifetime warranty. Please visit manufacturers website for further details.